76 Commonwealth is located on the south side of Commonwealth, between Berkeley and Clarendon, with 74 Commonwealth to the east and 78 Commonwealth to the west. 76 Commonwealth was built ca. 1872 by Charles J. Fox, a mason and builder, one of three contiguous houses (76-78-80 Commonwealth) he built for speculative sale. All three houses were Brownstone Gothic in style, designed as a symmetrical grouping: 76 Commonwealth and 80 Commonwealth as mirror opposites with bays flanking 78 Commonwealth with a flat façade. 78 Commonwealth was replaced in 1922-1923, the fenestration on the second and third stories of 80 Commonwealth was altered sometime prior to the early 1940s, and the original mansard and Gothic dormers of 76 Commonwealth were replaced in the early 1970s. Charles Fox purchased the land for 76-78-80 Commonwealth on July 5, 1871: two 26 foot wide lots he bought from the Commonwealth of Massachusetts, and a four foot wide strip to the west he bought from Edward Ingersoll Browne, part of a 26 foot lot Edward I. Browne had acquired from the Commonwealth on April 28, 1871. Charles Fox subdivided the combined 56 foot lot into three lots, each 18 feet 8 inches in width. Click here for an index to the deeds for 76 Commonwealth. On April 1, 1873, 76 Commonwealth was purchased from Charles Fox by attorney Samuel Worcester Bates. He and his wife, Anna (How) Bates, made it their home. They previously had lived at the Hotel Pelham (southwest corner of Tremont and Boylston). They continued to live at 76 Commonwealth during the 1879-1880 winter season, but moved thereafter to 320 Marlborough. On November 29, 1879, 76 Commonwealth was acquired from Samuel Bates by Miss Mary Miranda Wood. That same month, she also acquired 78 Commonwealth. Mary Wood was daughter of real estate and insurance dealer Charles Austin Wood and his wife, Caroline Elizabeth (Wilson) Wood, and the properties probably were purchased on her father’s behalf. 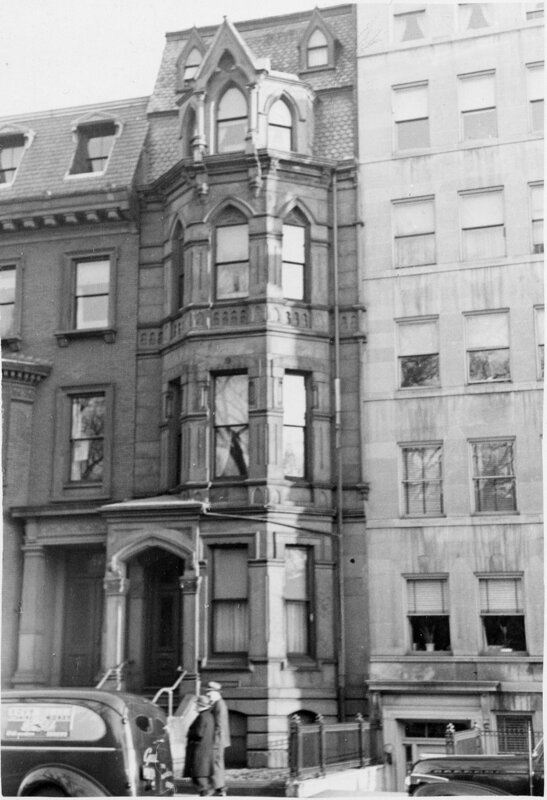 She and her parents lived at 78 Commonwealth during the 1880-1881 winter season and then moved to 87 Chester Square. They previously had lived at the Hotel Vendôme, which Charles Wood had owned and operated. On March 9, 1880, 76 Commonwealth was acquired from Mary Wood by Dr. Allen Melancthon Sumner. He and his wife, Ellen Frances (Prescott) Sumner, made it their home. He was a physician and also maintained his office there. They previously had lived (and he had maintained his practice) at 4 East Brookline. 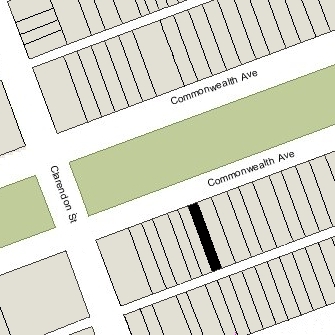 They continued to live at 76 Commonwealth in 1886, but had moved to 150 Commonwealth by 1887, where they lived and he maintained his medical practice. 76 Commonwealth was not listed in the 1887 and 1888 Blue Books. On July 9, 1887, 76 Commonwealth was purchased from Allen Sumner by Elizabeth (Farrell) O’Brien, the wife of Hugh O’Brien. They previously had lived at 2886 Washington. Hugh O’Brien served as Mayor of Boston from 1885 through 1888. He was the founder and editor of the Shipping and Commercial List and, in the mid-1880s, was treasurer of the Brush Electric Light Company. By 1888, he was Vice President of the Boston Electric Light Company and President of the Union Institution of Savings. Hugh O’Brien died in August of 1895, Elizabeth O’Brien and their two children, Henry Clinton O’Brien, a dentist, and Madeline O’Brien, continued to live at 76 Commonwealth during the 1895-1896 winter season, but moved soon thereafter. She continued to own 76 Commonwealth and lease it to others. By 1897, 76 Commonwealth was the office of Dr. Reuben Albert (called Albert) Reeder, a physician. He and his wife, Susie L. (Champlin) Reeder, lived in Melrose. He continued to maintain his office there in 1899, but by 1900 had moved it to 224 Marlborough. During the 1899-1900 winter season, 76 Commonwealth was the home of Harriet Newell (Small) Sanborn, the wife of James Solomon Sanborn. Their home was in Somerville and it appears she may have been living in Boston because of medical issues (she died in February of 1901 in Somerville). James S. Sanborn was co-founder of Chase & Sanborn, wholesale tea and coffee dealers. The house was not listed in the 1901 and 1902 Blue Books. On July 15, 1902, 76 Commonwealth was purchased from Elizabeth O’Brien by Miss Ellen Reardon. Ellen Reardon was joined at 76 Commonwealth by her brother, Dr. Timothy Joseph Reardon, a physician specializing in the nose and throat, who also maintained his medical offices there. He previously had lived and maintained his office at 139 Beacon. Dr. John Samuel Phelps, also a physician, lived with the Reardons and maintained his offices there (he also previously had lived and maintained his office at 139 Beacon). In addition to his private practice, Dr. Phelps was medical director of the Columbian National Life Insurance Company. He was unmarried. He continued to live (and maintain his office) at 76 Commonwealth until about 1935, when he moved to Lynn. In about 1907, Timothy and Ellen Reardon were joined at 76 Commonwealth by their mother, Catherine (Cronin) Reardon Tobin, the widow of Timothy Reardon and of Richard R. Tobin, and their half-sister, Mary A. Tobin. Prior to Richard Tobin’s death in November of 1905, they had lived in Roxbury. Catherine Tobin died in March of 1912. Timothy and Ellen Reardon and Mary Tobin continued to live at 76 Commonwealth. In October of 1915, Ellen Reardon and Mary Tobin mortgaged a number of properties, including 76 Commonwealth, to Edward E. Moore. He assigned the mortgage to Frederick E. Jackson, and on January 3, 1917, Frederick Jackson foreclosed on the mortgage and transferred the properties to the Fenway Building Trust. 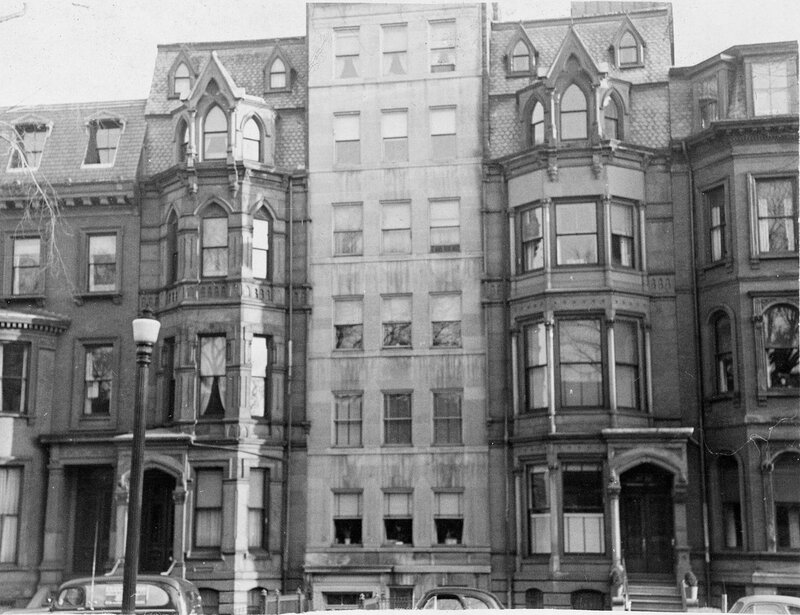 The Fenway Building Trust was owned by Joseph P. Kennedy – real estate dealer, banker, and patriarch of the Massachusetts Kennedy family – and Edward E. Moore, the original holder of the mortgage, who had been secretary to Joseph Kennedy’s father-in-law, Boston Mayor John F. Fitzgerald, and also had worked for his successor, James Curley (according Jack Beatty’s biography of James Curley, The Rascal King, future US Senator Edward M. Kennedy was named after Edward E. Moore). In his The Patriarch: The Remarkable Life and Turbulent Times of Joseph P. Kennedy, David Nasaw cites this transaction with Ellen Reardon and Mary Tobin (whom he describes only as “two women who owned property in Boston”) as an early example of the real estate operations of Joseph Kennedy and Edward Moore. On January 17, 1917, Timothy Reardon acquired 76 Commonwealth back from the Trust. Timothy Reardon died in February of 1938. 76 Commonwealth was inherited by Ellen Reardon and Mary A. Tobin, who transferred it to themselves as joint tenants on March 26, 1948. Ellen Reardon died in June of 1952. Mary Tobin continued to live at 76 Commonwealth until about 1953. 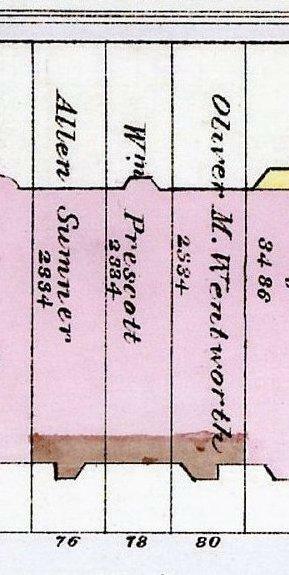 The house was shown as vacant in the 1954 City Directory. On May 7, 1953, 76 Commonwealth was acquired from Mary A. Tobin by Dr. Chauncey Nye Lewis, a dentist and oral surgeon. He was a widower. In September of 1953, he applied for (and subsequently received) permission to convert the house from a single-family dwelling into a three-family dwelling. After the remodeling, he made 76 Commonwealth his home. In the 1960s, Dr. Lewis appears to have increased the occupancy to ten units. He continued to live there until his death in February of 1969. On October 29, 1970, 76 Commonwealth was purchased from Chauncey Lewis’s estate by Nick Haddad, trustee of the Haverty Realty Trust, who already owned 74 Commonwealth. 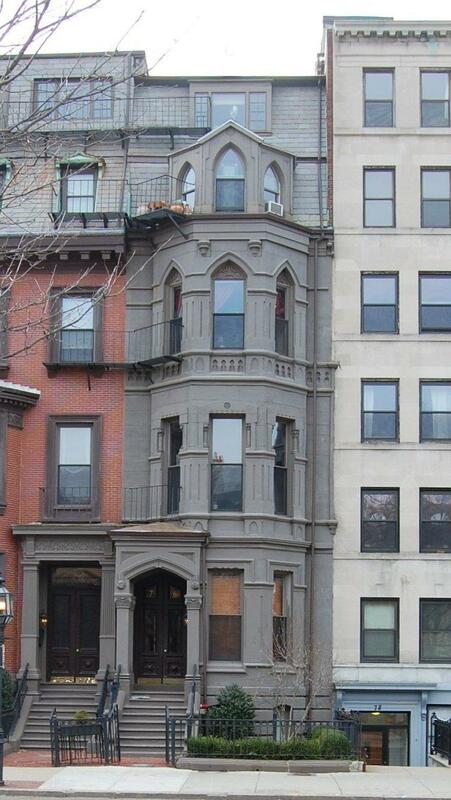 After acquiring 76 Commonwealth, he remodeled the top story, eliminating the original Gothic mansard and dormers.